Welding is often an expensive answer to joining stainless steel pieces together. There are not many people with welding tanks readily available for a small project such as fixing appliances. Gluing is a better route to take in adhering two pieces of stainless steel. Dilemmas such as the metal feet falling off of a toaster or an plate on an air conditioner unit coming loose can easily be remedied by applying a metal epoxy. The epoxy is a strong holding compound that is often referred to as a "cold weld" process. Applying a metal epoxy to stainless is a quick and easy fix. 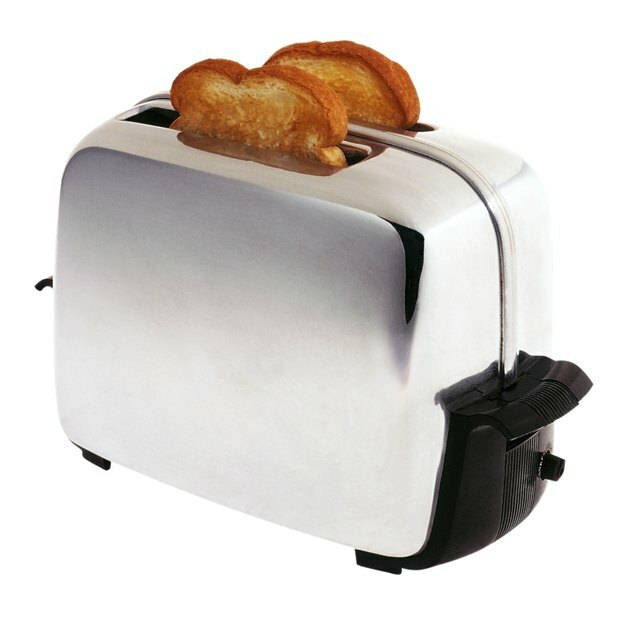 Glue can be used to fix small stainless steel items, such as this toaster. Clean and prepare the pieces you wish to glue together with soap and water. Dry thoroughly with a soft, dry towel. Place a paper plate onto a hard work surface. Uncap both tubes of the epoxy compound. The two parts cannot be mixed until you are ready to apply them to the item. The two elements come in two separate tubes. Squeeze equal parts from both tubes onto the paper plate. Use the toothpick or Popsicle stick to thoroughly stir the epoxy. Use toothpick or Popsicle stick to apply the epoxy to the pieces of metal. If the area to glue is larger, use the Popsicle stick for better coverage. Adhere the metal pieces together. Use a clamp to hold the pieces together if necessary. Let the epoxy set per the directions on the packaging before handling the item. Some formulas set in as little as five minutes, while others take four to six hours. Allow the item to dry overnight or 15 hours before putting the item to use.